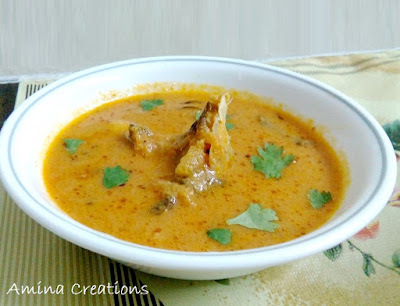 This is a simple and delicious recipe of fish curry using very few ingredients. The dish gets done in just about 15 minutes and can be served with rice and appam/ pappad. Wash and clean the fish slices with water. Transfer them to a bowl, add turmeric powder and mix well. Set aside. Heat oil in a non-stick pan, add onions and saute till the onions turn soft. Add ginger garlic paste and saute till the raw smell goes. Now add red chilli powder, coriander powder, cumin powder and salt and mix well. Add tomato puree and cook till oil starts separating. Add coconut paste and 1 cup water and bring to a boil. Add coriander leaves and the fish and mix well. Cover with a lid and cook for 5 to 10 minutes in medium flame till the fish is cooked.